Bond knitting machines have been around for quite a long time. Although I don’t think they are still manufactured, there are many machines still in active service and a great many more, gathering dust in attics and closets and under spare room beds. 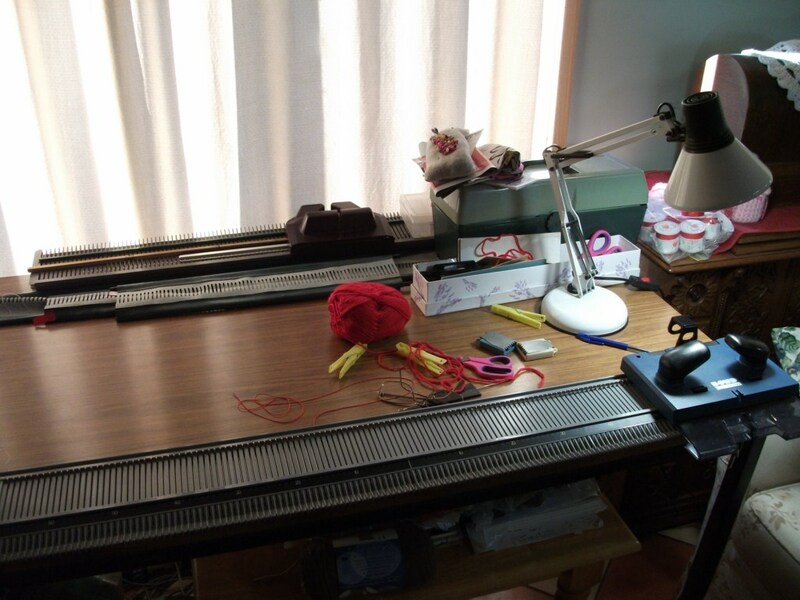 The Bond knitting machine is very basic, with a plastic bed and carriage and metal needles. They came in several flavors; the Classic, The Incredible, the Elite and the Ultimate. I don’t know what the differences are, but I do know that there were at least two variations in the needle spacing that was used. My partner, Jan has several Bond Knitting Machines and she loves them. She is what you might call a ‘power user’, turning out a couple of garments each week, every week. She has been using her current, Bond Elite for more than two years and it is still working perfectly. Bond Knitting Machines are remarkably robust, despite the impression of fragility that I mistakenly arrived at, when I first saw one. 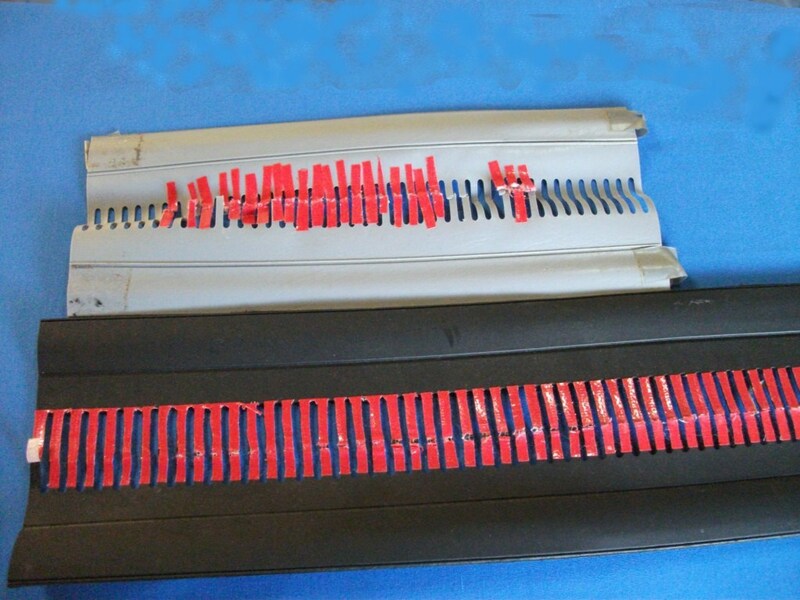 They do however have one serious weakness ….. a weakness that is the bane of every owner of a Bond Knitting Machine. These machines use a thing called a weighted hem, to hold the initial stitches in place. A weighted hem, for anyone who doesn’t know, is a strip of material that has a weighted rod held in a hem along each edge and a series of slots through its centre, which fit over the needles of the knitting machine. The great weakness in Bond knitting machines, is the weighted hems that were provided. The material between the slots invariably breaks. Most users make a futile attempt to repair their weighted hems. I know we did. But as fast as we’d repair the breaks, more would occur. Jan purchased a replacement weighted hem which was sold as a ‘heavy duty’ version and we eagerly awaited its arrival. It proved to be about as robust as its predecessors. Jan spent a lot of time on the internet, searching for solutions to this problem. What she discovered was that some folks had made their own substitutes for weighted hems. One suggestion involved a wooden hem with metal hooks that would attach to the ravel cord, between the needles. Another was for a knitted version of the weighted hem. None of the proposed solutions sounded very viable for a user who was churning out garments the way that Jan was. In the end, we concluded that the original design was probably the best approach but the material used to make the hems was the obvious fault. I got busy and made Jan a few weighted hems using upholstery weight vinyl (leatherette, naugahyde, PVC …. depending on where you live). 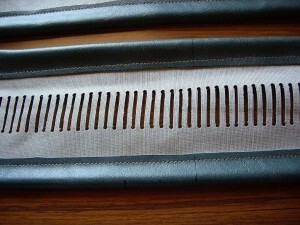 The slots were cut by hand and they are hemmed using #40 weight, bonded nylon thread. They are tedious things to make. 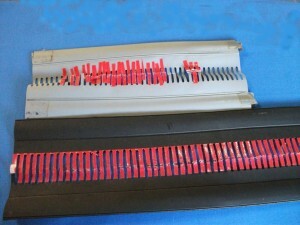 Every slot must be carefully cut with exactly the right spacing to match the machine’s needle bed. One slip and the entire job is ruined. The end result though was far better than we would have dared to hope. Jan has been using my weighted hems constantly for several months now. Not only have they outlived any of the commercial ones that she bought previously, but they are showing no signs whatever of wearing out or failing in any way. If you have been struggling with an original weighted hem that is more repairs than original material, or if you are trying to achieve good results using some alternative design then I just can’t recommend our approach strongly enough. If you can’t quite be bothered making your own, we are offering these for sale and have already mailed our home manufactured hems to buyers in the UK, the United States and Europe. If you are interested in obtaining one of our hems, please email me (ac@andrewcaddle.com). I charge 35 cents AUD per stitch i.e. $35.00AUD for a 100 stitch hem and can produce hems to whatever length you require. Mailing costs are currently $17 AUD for USA and $20AUD for the UK and Europe. We have sent our hems all over the world and we have never had one go astray. Although Jan does list them on Ebay, we would be very grateful if you would purchase them directly from us instead and help us to avoid the Ebay fees. We can accept payment via Paypal and will send you a Paypal invoice when you order by email (ac@andrewcaddle.com). Please note: the actual hem weights are not included when I supply a replacement hem. The weights are simply lengths of mild steel rod of 6mm or greater diameter and roughly the same length as the hem. Most people already have the steel rods from their old hem but appropriate lengths of steel rod can be obtained very cheaply from your local hardware store. The cost of mailing lumps of steel all over the world would far exceed the purchase price at your local hardware supplier. Bond knitting machines are an excellent, simple design and, given appropriate care and maintenance, they will last indefinitely. If you can get by the weakness of the original weighted hems, they will produce beautiful knitted garments of excellent quality … and will keep on doing so for a very long time. If you use a Bond Knitting Machine, there are a couple of pointers that I can offer, having watched Jan working with hers for quite a long while. 1. Never attempt to use your Bond Knitting Machine in a cold environment. Jan has found that her machine operates far better in a warm room and never tries to use it until her work area is warmed to a comfortable temperature. 2. Service your machine regularly. Remove all traces of fluff and lint from all parts of the machine. 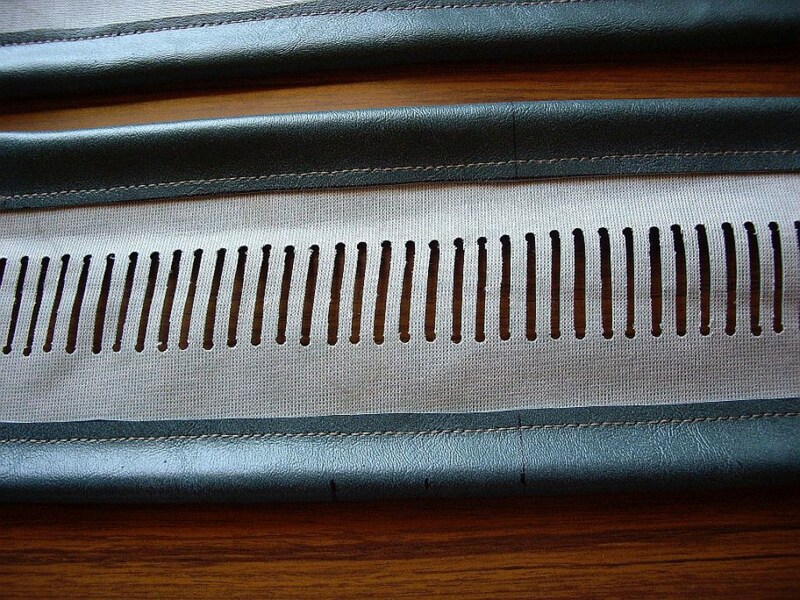 Lubricate the bed, the inside of the carriage and the stitch plates. Jan uses silicone spray, sprayed onto a rag and wiped over all of the relevant surfaces. 3. Use appropriate ravel cord and change to new cord regularly. Jan changes her ravel cord at the first sign of it binding in her work. 4. If using a vinyl weighted hem of the kind that we do, make very sure that the underside of the vinyl comes into contact with the ravel cord. Under no circumstances should the ravel cord contact the shiny (finished) side of the vinyl. Doing so can cause the ravel cord to bind and damage your weighted hem …. even if you only make this mistake once! (Ask me how I know). Well, there you are. I hope this information will prove useful for those people who are still operating their Bond Knitting Machine. Having seen countless examples of the great results that can be had from these machines, I can’t praise them highly enough. While they might not be the easiest machine to master, they certainly do provide wonderful rewards for patience and perseverance. Finally found you after hours of searching for spares for the Incredible Sweater Machine. In the meantime I have found my machine stored away. I thought I had got rid of it. I always was a hoarder. The only things that are missing are the two nuts and bolts to join the two sections plus extension beds together. I cannot find anywhere where these bolts can be obtained. I’m disabled and housebound which is why I need to rely on the Internet. Can you help or do you know where I can obtain them, please? Hello Sue. The bolts that were supplied with our Ultimate machine are actually made from plastic. They had a thread length of 15mm and a thread diameter of 6mm. There is no need to use plastic bolts and in fact, I think you would find steel ones to be much better. These can be obtained for pennies from any hardware supplier (I think you call these stores ‘ironmongers’?). You will need one 6mm bolt, one matching nut and two flat washers for each joint that you wish to secure. The bolts need to be 6mm (1/4″) flat shouldered (not countersunk) and have a thread length of around 20mm (3/4″) or more. It doesn’t matter if the threads are a bit longer. The important thing is that the thread goes all the way to the bolt head (i.e that there is no bare (un-threaded) portion of the shank. Don’t worry if you don’t know what these terms mean. Your hardware supplier certainly will. According to the instructions that came with the ultimate, using the bolts to secure the sections is optional. Apparently, some people like to dismantle their machines and store them away when not in use. I think that it would be much better to use the bolts, even if you were inclined to disassemble the machine for storage. The machines in this house are permanently set up and are only ever disassembled for maintenance and cleaning. My partner Jan suggested that, if you are using an extension on your machine, you will find that a full length hem will work much better than piecing together shorter hems. Also, it is important to use rods that are likewise, the full length of your available hem, rather than using joined sections of rod. If you need longer rods, that is something that you can also obtain from your hardware supplier at very little cost. Simply ask for 8mm diameter, mild steel rod in whatever length you require. I hope this information will help you sort out your needs. If we can be of any further help, please don’t hesitate to get in touch. Do you happen to have a pattern you use for your weighted hems? Hello Valerie, No, I don’t have a pattern for my hems. You can simply determine the necessary dimensions from your existing hem. However, the accuracy of your marking out is absolutely critical and a sigle slip while cutting out will see you starting over. I am fairly certain that, long before you finish your own hem, you’ll be wishing you had simply bought one of mine. After making a great many of these, it still takes me about three hours of careful and tedious work to produce one of my hems. Thank you so very much, Paige. I really can’t tell you how much I appreciate you taking the time to leave such lovely feedback. I have been making my hems for quite a few years now and have sent them to pretty much every corner of the globe. I almost never receive any kind of follow-up from the folks who buy them. The demand is obviously very limited and I’d soon starve if I was relying on hem sales to buy the groceries. But I do enjoy making them and I like to think that I am providing a product that will enrich somebody else’s enjoyment of their hobby. It is so wonderful though, to actually receive some feedback. You really did make my day. how much do you charge for one of your weighted hems? Hello Tina and thank you for your inquiry. My partner Jan is still using the hem that I originally made for her. It’s showing no signs of wearing out after more than two years of churning out at least a couple of garments every week. I really doubt that I will ever need to replace that hem. The cost of the hem depends on how long it is. I currently charge $0.35 AUD per stitch …….. so $35.00 for 100 stitches, $45.50 for 130 stitches etc. Postage to the USA is $16AUD and to the U.K. …. $21AUD. Postage within Aust is $10. I can make whatever length hem you require; the longest one so far being a 220 stitch one for a lady in the U.K.. I can generally manufacture a hem within a couple of days of receiving an order. I’d be even happier to deal directly, without Ebay’s exorbitant fees. I can receive payments via Paypal or, if you live in Australia, I can receive direct bank transfers. If you’d like something special or you want to buy without going through Ebay, please let me know. If Ebay is your only option but you need a custom length hem, we can certainly do a special listing for you. I hope we will hear from you and it will be our pleasure to Attend to your needs. I just purchased a new to me, but previously used machine (it is in like new condition). The information you provided is very helpful. Thank you! Thank you, Connie. You are so very welcome. What Jan is able to make with her Bond/USM is outstanding. I own both the USM and the Bond Elite. When my weighted hem finally “bites the dust”, I will have to order one from you. Thanks for adding your talent and skill to us machine knitters! Thank you so much Helen, for your kind remarks. I know that Jan will be thrilled when I share your message with her. I do enjoy getting to watch her work, seeing those pictures ‘come to life’ as they transition from a vague outline to a vibrant image. Jan uses her Elite machine pretty much exclusively and she loves it. I like to imagine that I’ve played some little part in creating all those great garments. The hems that I originally made for her have survived years of constant use. Thanks again for taking the time to get in touch. I really do appreciate it.